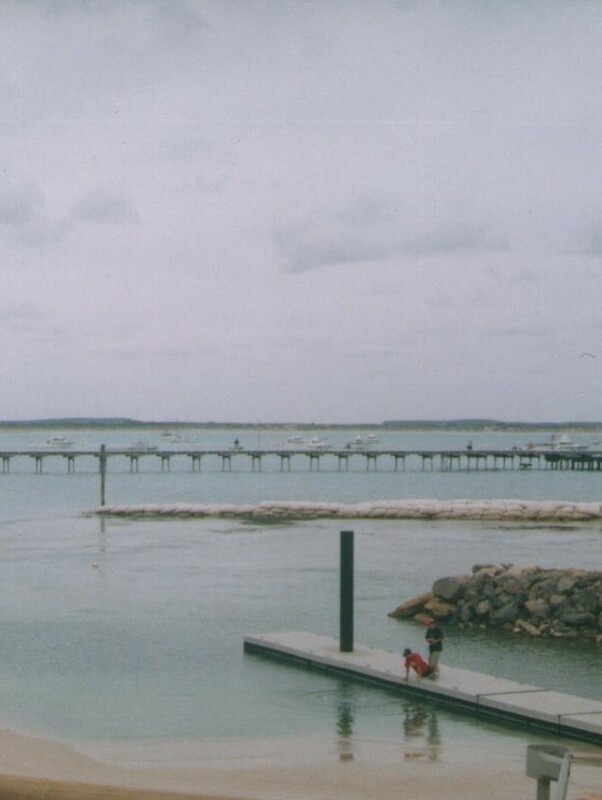 The Beachport boat ramp issue | Marine Life Society of South Australia Inc.
We recently received an email request from a student for our assistance with their school project. The student agreed to take on the degradation of the beach at Beachport as their topic. 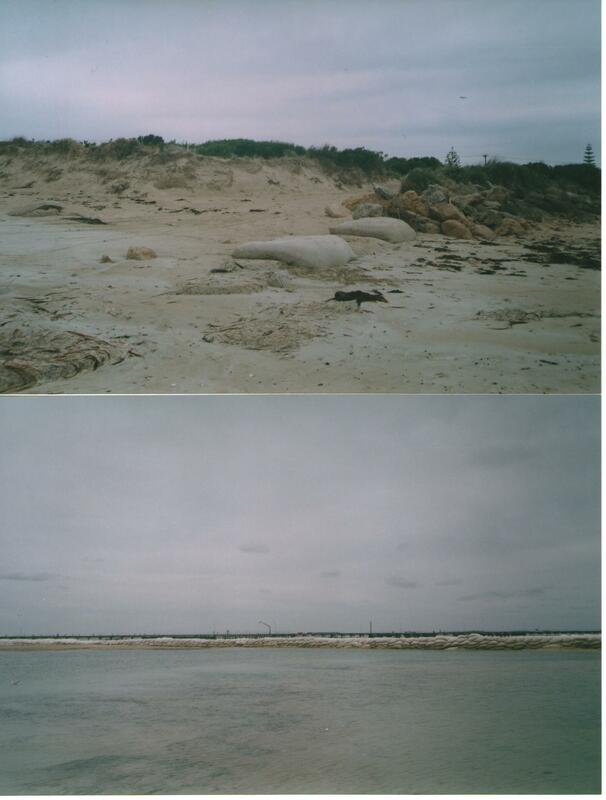 The degradation was thought to have been caused by a boat ramp being placed on the beach in the wrong position. “I first became involved in the topic of the Beachport boat ramp late in 2003. I was told that the old boat ramp had been quite hazardous and had to be removed. A temporary ramp was approved to replace it in November 2003. Approval for the temporary ramp was given for just two years from 11th November 2003. The State Government’s John Hill MP said at the time that the temporary ramp had been proposed by Transport SA. Transport SA had instigated the temporary ramp because the old ramp had been very difficult to maintain in a safe and functional condition. Repairs could have been made to the old ramp to resolve some of the safety issues. The angle of the old ramp in relation to a longshore current, its slope and its length, however, could not be resolved. These hazards could only be resolved by completely rebuilding the ramp at an estimated cost of approximately $80,000. The Rivoli Bay Foreshore Advisory Committee was formed to prepare a foreshore management strategy, including recommendations for the best site for a new permanent ramp in the long-term. The old ramp was removed and a temporary ramp was built. A two-lane trial ramp had been built despite the recommendations of many well-respected coastal and environmental experts. They had been concerned about the proposed location of the temporary ramp, the risk of seagrass loss, sand movement and build-up, but their concerns were ignored. A temporary sandbag breakwater was also built parallel to the shore to protect the temporary boat ramp. I visited the area in early January 2004 to inspect the temporary ramp I take a few photos. I found a messy situation with possible environmental consequences. Sand was already building up around the ramp and breakwater. The local community had lost a section of the public beach and only had access to another small section of beach. The temporary sandbag breakwater was an ugly eyesore. There was much mess around following the construction of the breakwater. Rubbish such as sandbags were left lying in the sand. A track made for the construction trucks remained. The car park area was in a bad state. I reported that an advisory committee was preparing a foreshore management strategy and, as part of the strategy, the Rivoli Bay Foreshore Advisory Committee will make recommendations for the best site for a permanent ramp in the long term. The ‘temporary’ boat ramp was given approval to become ‘permanent’ – with the severe damage to the area as I had predicted. A group or local residents challenged the decision to make the temporary boat ramp permanent in the Environment and Resources Court in 2013 and lost, so the boat ramp construction went ahead. The predictions by the engineer that the ramp would need to be dredged once every five years, at a cost of around $50 000 have been shown to be extremely unreliable. It is now coming up to its 3rd year of operation, and in the first year the dredging costs were around $370 000 – or a $1000 a day. The engineer predicted that the sand would ‘move on’ beyond the tip of the boat ramp towards the jetty, but instead it refracts around the tip and enters the ramp, causing the silting .. The Wattle Range Council has tried to find a permanent dredge – but none is available that is suitable for the job. A few days before the March long weekend this year, 2017, a strategy was used whereby 6-8 ‘cylinders’ about 1.5 m in diameter were excavated to a depth of around 2 m across the floor of the boat ramp. The purpose of this exercise was to allow the incoming sand to fill these ‘holes’. This exercise was reported to cost around $40,000. 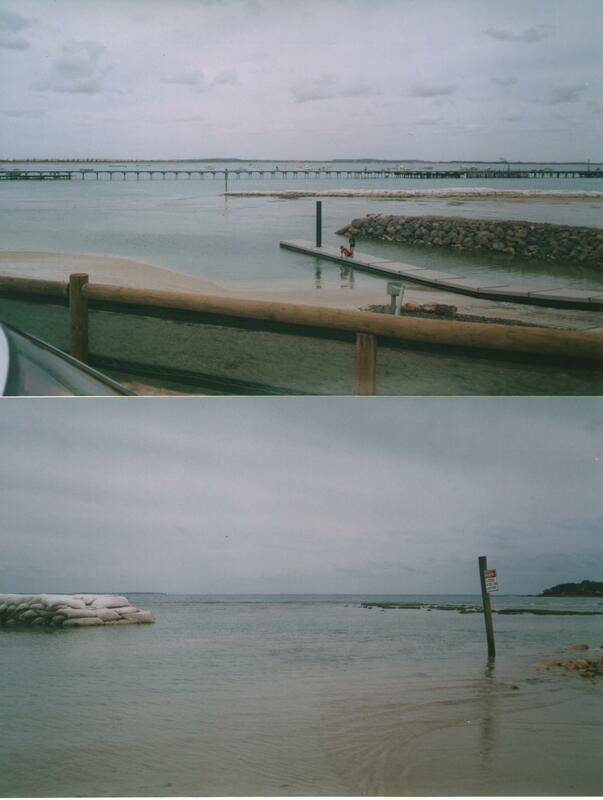 I did a short dive at the Beachport jetty following my visit to the temporary boat ramp in January 2004. My dive lasted just 32 minutes, mainly since I was diving alone, I didn’t know the area, the sea was swirly and visibility was poor. I did my dive late in the afternoon (4.40 to 5.12pm). It was during a low tide. The sea was calm but the conditions were quite swirly for me. I made a jump entry from the lowest platform that I could find on the jetty. I reached a maximum depth of just 3 metres whilst searching the area beneath the jetty. Apart from finding a fishing rod and a squid jag, the only marine life that I recorded sighting there were a juvenile Dusky Morwong, a flathead, a juvenile leatherjacket, a red swimming anemone and lots of other sea anemones. My dive probably lasted 32 minutes simply because I had to swim back to the beach to exit the water. The low tide, swirly seas and 3-metre depth wouldn’t have helped with the visibility, but perhaps the recent construction of the temporary boat ramp and sand bag breakwater may also have influenced visibility. Thanks for providing this overview, Steve.